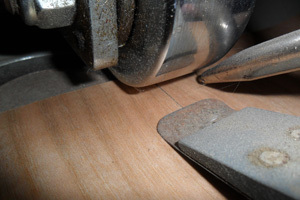 Before cutting any sheet material for a project the finished cut sizes are entered into panel cutting software to ensure that the project is processed in the most efficient manner. 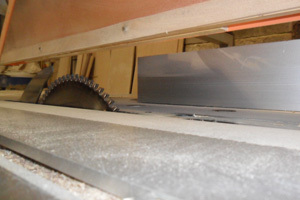 We have two saws one specifically for cutting sheet material such as chipboard and mdf, and the other specifically for splinter-proof cutting of constructional veneers, plastics and plastic coated boards with milling unit for a precise cut. 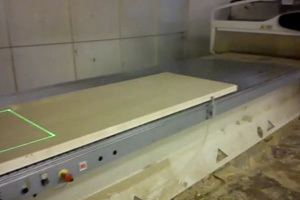 We make use of a lipping press for applying solid timber to chipboard and MDF doors and panels, with its open front and ended design we are able to cater for any size substrate. The glue line is cured by radio frequency waves in under a minute and trimmed flush to the surface by hand with Festool edge routers. Panels and doors must be perfectly flat prior to veneering, if you're supplying free issue items we will do this for you. 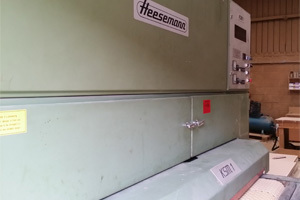 Our wide belt sander is capable of calibrating sheet material from 3mm to 150mm thick by 1310mm wide, two heads each equipped with a 40grit belt provide a perfectly flat surface for pressing. 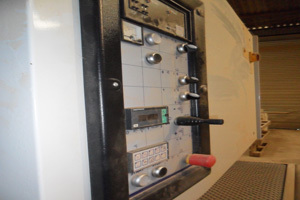 We can CNC machine your doors for any manor of items, such as hinges, locks / latches, wireways, acoustic seals, vision panels and feature grooves. With a bed size of 6.7 x 1.5 metres and three axis cutters the possibilities are almost endless. 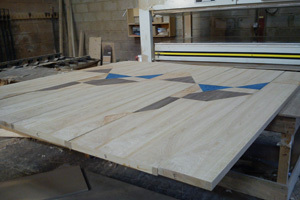 The majority of our veneering work is bespoke where quality is of the utmost importance. We hold a wide variety of veneers in stock and prepare by hand, matching doors and panels to one another, incorporating marquetry patterns and veneer inlay lines. 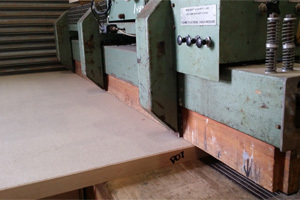 The vast majority of our projects have decorative veneers, laminates or papers applied using the hydraulic hot press. With Elkom heating platens we can guarantee a constant temperature across the platens. We can also veneer shaped panels such as bow fronted doors and drawers, beveled edge panels and curved ends. Our veneered panels and doors are sanded crosswise to the grain direction first and are afterwards sanded in the direction of the grain. Equipped with magnetic pressure beam system and two pressure segment belts to ensure a perfect finish. Our doors can be supplied factory glazed using splayed and rebated beads or quirk beads. 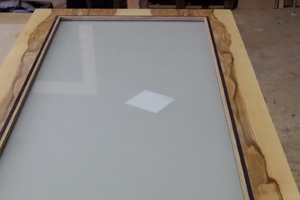 We can also offer concealed glazing beads where the door is fully glazed prior to being calibrated and veneered creating a seamless edge between the glass and the door. Choosing the right finish for your product will enhance its overall appearance and as standard we recommend the use of polyurethane lacquers and paints. 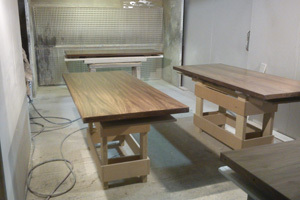 We can also undertake liming, tinting, staining and oiling if required.